Oh, I’ve been very bad these last few months. 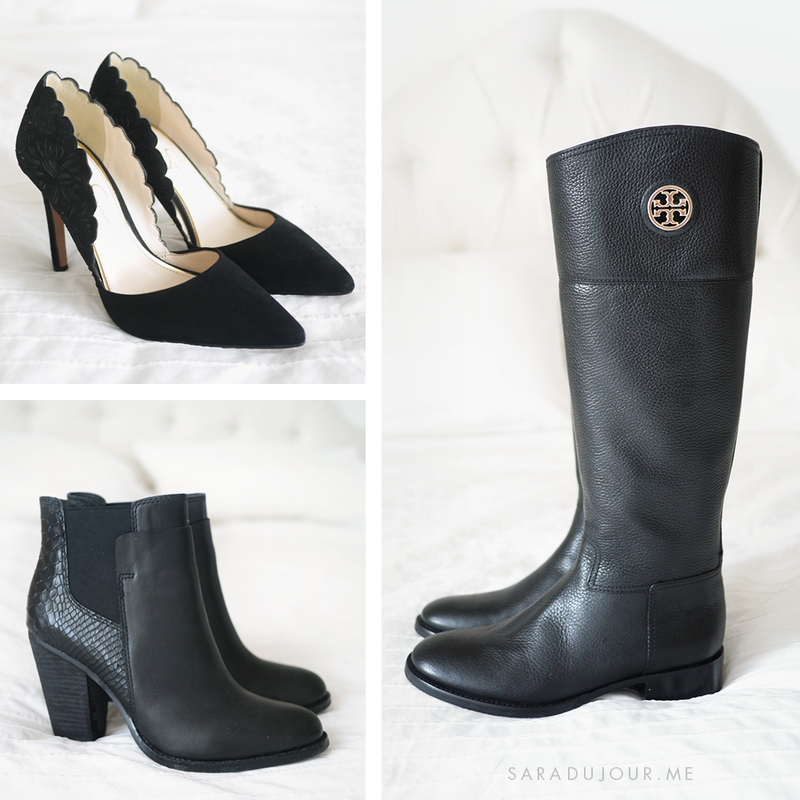 This boot and shoe haul is a bit delayed because of all the busyness that is the holiday season, but better late than never I suppose! Forgive me father for I have sinned – there were too many amazing sales around Black Friday, and I am weak. This shoe haul is a collection of footwear I snagged at an amazing price the week of Black Friday, as well as a very generous Christmas present. But fear not! If you are coveting thy internet neighbour’s shoes, all of these are still currently available in stores. 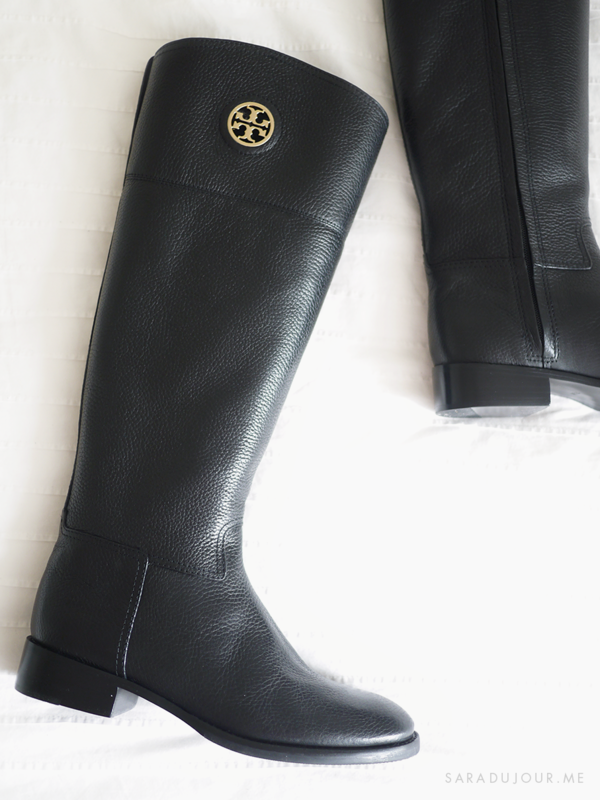 Let’s start with the big ticket item – these Tory Burch “Junction” riding boots in black were a Christmas gift. My dad asked me what I wanted, and I said a pair of quality boots to wear through the fall and winter season, particularly because our cold weather months can last so long here in Canada. He knew I liked these boots in particular, and very generously gifted them to me. They came so beautifully packaged in a brightly-coloured Tory Burch shoe box with patterned tissue paper. 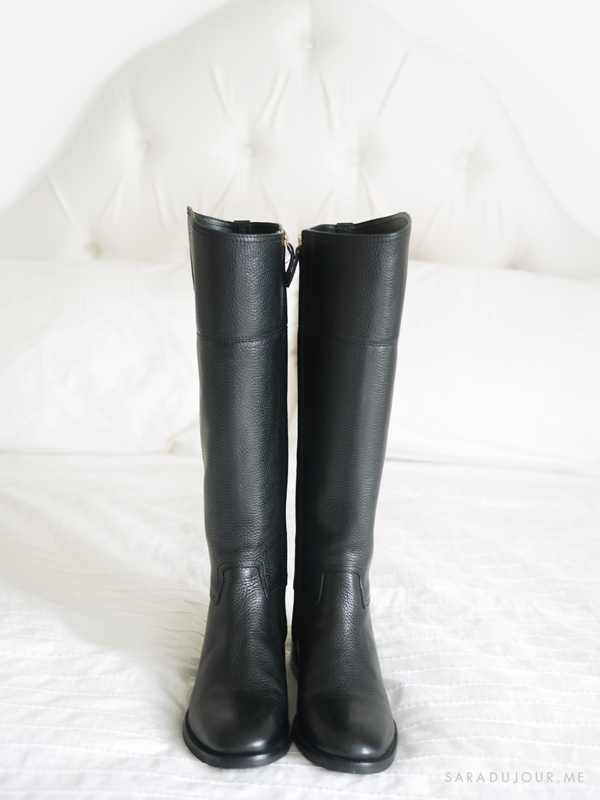 I’m partial to preppy and equestrian styles, so these riding boots are perfect. Plus, since they’re black, I can wear them with just about anything. They zip up the sides, making them easy to quickly put on and take off, and the gold logo detailing is a beautiful touch. 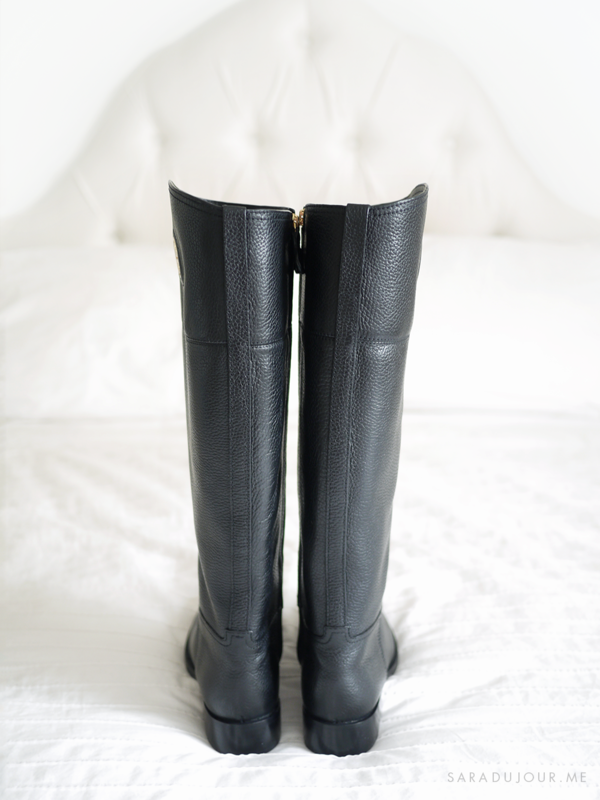 They’re available in regular sizing and extended calf sizing, and also come in brown. I was debating between the two colours for a while, they’re both lovely. And they’re on sale now! I got them in the post a bit before Christmas, but now that it’s January, I can finally start wearing them. 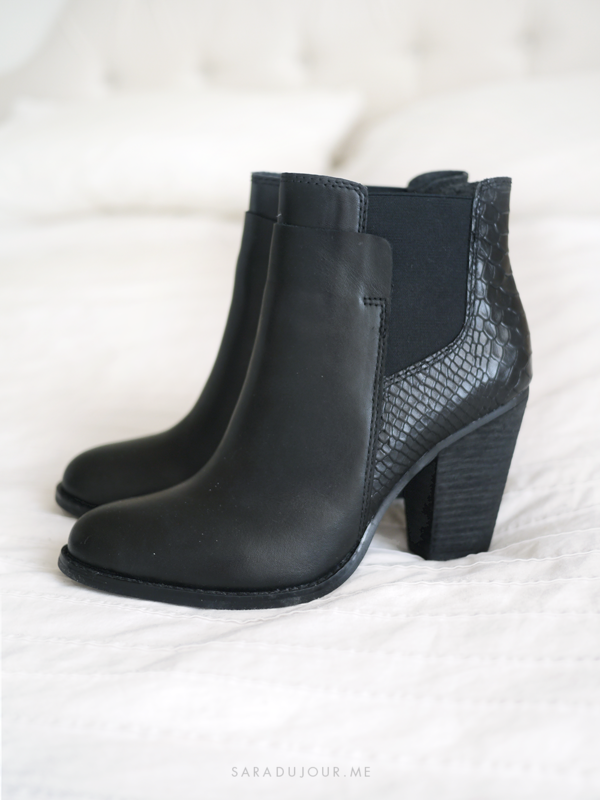 Next up are these black almond-toe Aldo booties with faux snake skin detailing. A friend of mine at work bought these a while back, and I absolutely drooled every time she wore them. Then Black Friday hit, and they went on sale (from $130 down to $65!) and she very kindly gave me permission to get a pair for myself, too. I did, and I’m in love with them. They look great with a pair of black tights or stockings. I’ve found that Aldo shoes and boots can be a little painful because they don’t have a lot of padding in the sole, so I’ll probably get a pair of cushioned insoles for them. If you’re getting a pair for yourself, they run true to size, despite the varying opinions in the reviews. And finally, these black suede beauties. In Canada, we have a big department store called The Bay. It’s sort of like our Macy’s or Bloomingdales. The week before Black Friday, they had a ridiculous one-day only online shoe sale. All the women at work sent the link around to each other like wildfire, and we all got to shopping. I browsed the whole selection and thankfully left with just one item, these Jessica Simpson “Cassel” pumps in black. I adore them. They are higher than I normally wear, but to hell with it, they are gorgeous and were down from $142 (CAN) to around $65. I love the scalloped detailing and the intricate cut-out design. If you want to see me wearing them, check out my New Year’s Eve outfit post. 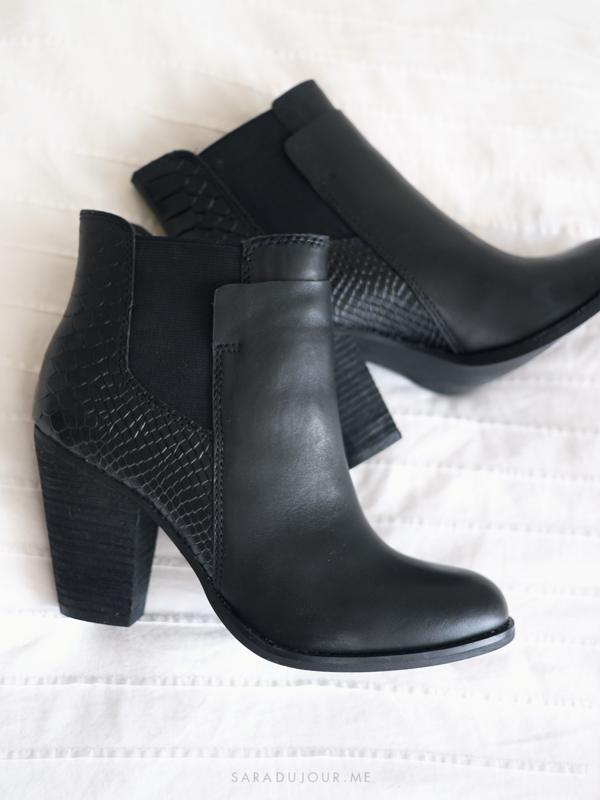 I love the Aldo booties! Thanks, Dena. Hope you’re having a great Sunday!